When you are trying to lose weight, there are few things more likely to ruin your diet than social gatherings. Cookouts, barbeques, pool parties—anything that involves hamburgers and hotdogs are rarely diet-friendly. Plus, choosing salad over a delicious burger can feel downright cruel. 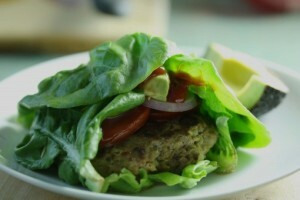 Before you give up your summer slim-down as a lost cause though, consider this lettuce wrapped, no bun burger instead. Hamburger buns, condiments, and low quality meat are often the culprits behind how hamburgers get so high in calorie and fat content. By swapping out your traditional hamburger bun with a lettuce wrap, you instantly cut around 110 calories and 20 carbohydrates. Check out the other healthier substitutions you can make to stick to your diet without missing out on your favorite cookout staple. 2 lbs ground turkey 93% lean (or if you really want that burger flavor 2 lbs ground beef 90% lean) – no ground chuck! In a large mixing bowl, combine your ground turkey or beef, salt, pepper, and Worcestershire sauce. Once thoroughly mixed, shape the meat into four patties. Turn on your stove top and heat a skillet to medium-high. Cook each patty for 4-6 minutes per side for a total of 8-12 minutes until the hamburger is cooked through the center. Carefully cut 2-3 lettuce leaves from the base so you can peel it away in tact. Top your hamburger patty with your condiments of choice, then wrap the lettuce leaves around the patty. Be sure to wrap it tightly as you do not want your condiments falling out of the wrap. The two most common types of lettuce used for wrapper burgers are iceberg and butter lettuce. Some other commonly used types of lettuce for wraps are Boston and green leaf lettuce. When choosing between iceberg or butter lettuce it really comes down to whether you want a more crisp lettuce crunch or ease of wrapping. Iceberg will result in a crisper wrap, while butter is easier to roll as it is softer. This information assumes you are using ground turkey, 2 large iceberg leaves, and does not include the various condiment options. Be aware that not all condiments are created equal. While a little mustard, tomato, and onion won’t set you back too far, condiments like mayonnaise will. For traditional burgers, the nutrition information is based on using a hamburger bun instead of lettuce leaves and ground chuck (80% lean) instead of ground turkey.